Should serve 4-6. Might serve 2. Oh my it’s mid November already. Where. Has. The. Year. Gone. Anyways, when the days get short and the air gets that nip in it my cravings take a sharp left turn away from the grill and salad for dinner and smack dab into a pit of gravy. Well the other day I found myself scanning the mancookgood Instagram feed and drooling over a yorkshire pudding posted by @sharonskitchenx of humbletartkitchen.com. Trouble is I’m not even sure what Yorkshire pudding tastes like and I had at least ten more hours of work in front of me. Nonetheless a seed had been planted and something had to be done. 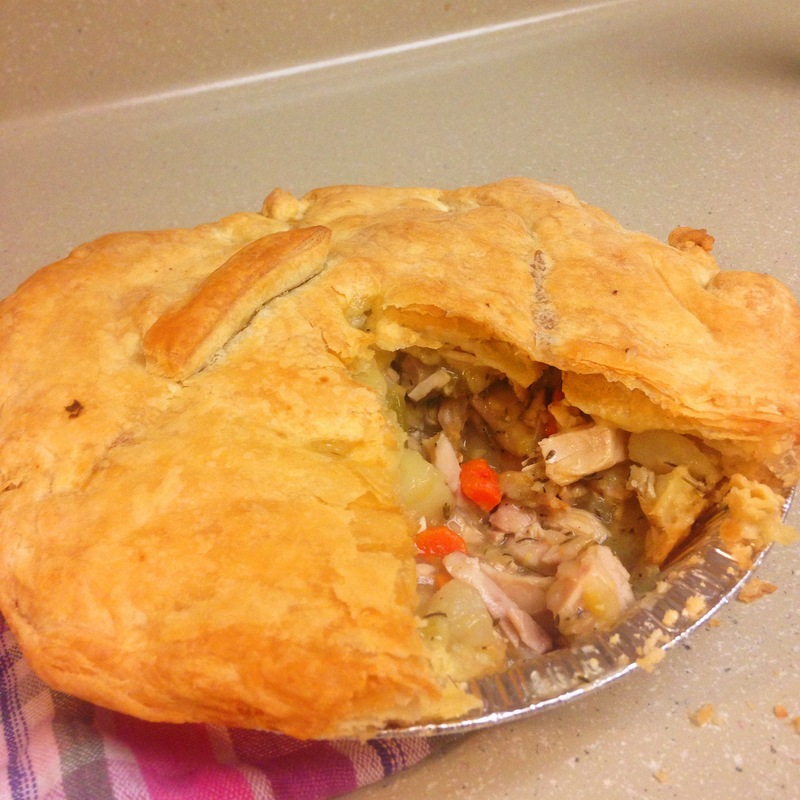 Chicken Pot Pie floated to the surface and I spent the rest of the day considering ways I could stop at the store on the way home, crank out a pie and eat at halftime without missing too much of the game. My quest for football season food never ends. The trick is finding something delicious I can make without slaving over the fires and missing half the action. Genius struck around 3pm and I was left without a choice. Put the oven on 375f / 190c. 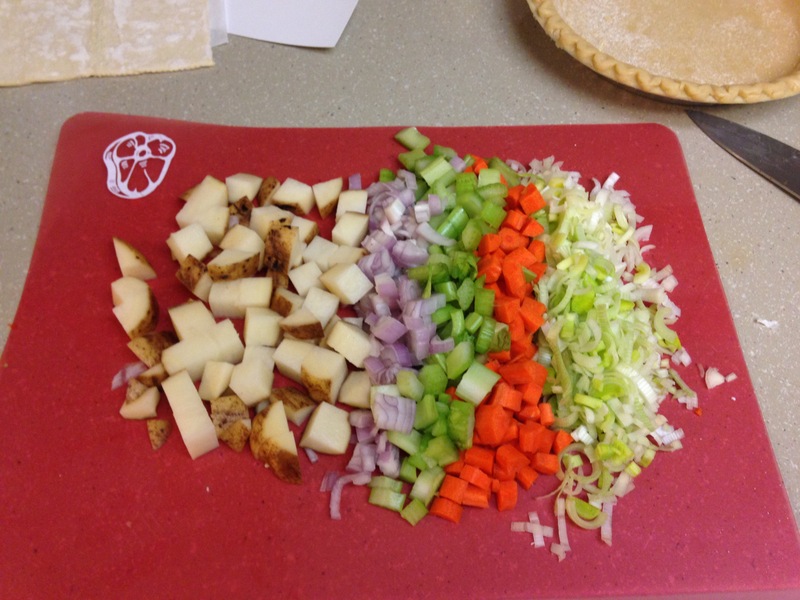 Take out a sheet of puff pastry and lay it out flat to thaw. 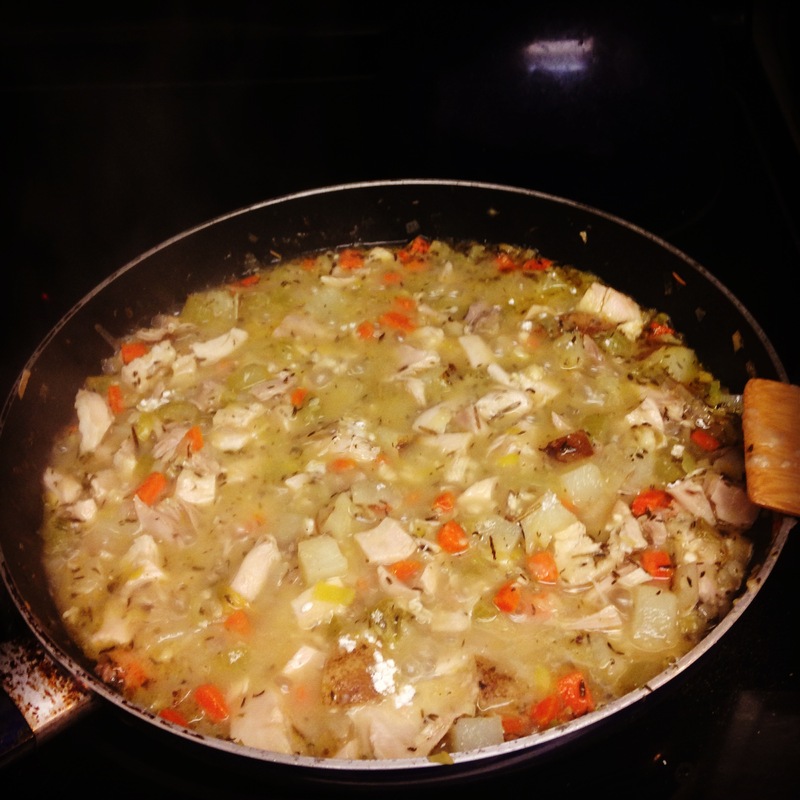 Chop the leek, shallot, celery, potato and carrots into small chunks. Toss it into a large skillet with olive oil on medium high. Salt and pepper. Next break done the bird. Slice of the wings first, eat one and hand the other to your friend. Do the same with the drum sticks. Then get into the breasts, thighs and back meat. Separate from the bird and remove the skin. Eat that or set it aside. Chop all the meat into bite size pieces. At this point the onions should be pretty soft. Add the chicken to the mixture, salt, pepper, lots of thyme, half as much rosemary and two bay leafs. (we’re in a hurry, need that extra punch of spice) Now add the chicken stock and turn the burner to high to get a boil going. While you let the mixture reduce slice the skin off of a lemon and cube it. Throw that in there. A little brightness in an otherwise savory dish. Let the liquid reduce by about half, sprinkle in a little flour a few times until the juice is almost as thick as gravy. This is to your preference, it’ll be delicious no matter what at this point. Pour the filling into a greased pie pan. Drape the pastry over the pan and seal it around the edges. Poke a hole in the top and put in the oven. I had a little pastry left over from the corners so I made some little chicken skin turnovers too. Cook some of the fat off the skin in the now empty skillet, wrap it in pastry. Put it in the oven on some greased foil while the pie cooks. Set the time for 30 minutes and go watch the game. Keep an eye on the pie for the another ten minutes until it’s the crust has browned nicely. Eat. Watch game. Have seconds. Yum.